PASADENA, TEXAS (September 29, 2017) Pasadena Memorial High School’s Marco Castillo and Tomball High School’s Delaney Nations were selected as the Outstanding Competitors of the Meet at the Pasadena Harvest Classic Swimming and Diving Invitational. The award was determined by a vote of the coaches and officials at the meet. The competition was held on Friday, September 29, 2017 and saw teams from as far away as the Lufkin, Texas area battling for supremacy in the crystal waters of Shippey Aquatic Center in Pasadena, Texas. Castillo competed in five individual events; bringing home three gold and one silver medals, and with leading the Mavericks to three bronze medals in relay events. The senior, who competed in both swimming and diving, won gold medals in the 50-yard freestyle, 50-yard breaststroke, and one-meter springboard diving, along with a silver medal in the 100-yard individual medley. In addition, he was an integral part of Pasadena Memorial’s success in the mixed 200-yard medley relay, 200-yard freestyle relay, and 400-yard freestyle relay. Castillo is coached in swimming by Robert Kelly and in diving by Darla Kelly. The Kelly's are long-time coaches in the Pasadena Independent School District. Nations scored three silver medals in the 100-yard individual medley, and as a member of Tomball’s 200-yard medley relay, and 400-yard freestyle relay. In addition, she placed fourth in the 50-yard butterfly and swam the anchor leg of their fifth place 200-yard freestyle relay. She is coached by Brian Vestal. In the team standing, Tomball took the title followed closely in the second place by Pasadena Memorial. Sam Rayburn High School place third with Pasadena High School in fourth and Huntington High School in fifth. “We’re not participating in the anthem today, not to be disrespectful. Instead, the team will 'remove ourselves from the circumstance' because “people shouldn’t have to choose. These are very divisive times times for our country. 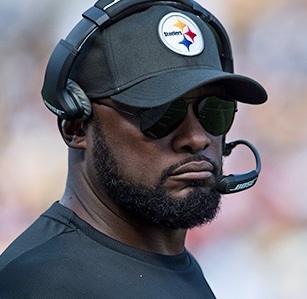 For us as a football team, it’s about remaining solid." the 86th minute, for the Houston Dash. HOUSTON, TEXAS (September 23, 2017) In their final home game of 2017, the Houston Dash (7-13-2, 23 points) fell behind in the first half, but their second half rally was not enough as they fell to the Chicago Red Stars (11-6-6, 39 points) by the score of 3-2 on Saturday evening. The 6,707 fans in the stands at BBVA Compass Stadium saw Houston hold the Red Stars scoreless in the second half, but their two goals were not enough to overcome Chicago's three-goal first half. her red card in the 89th minute. Houston cut the Chicago lead to one when defender and team captain Amber Brooks converted a penalty for the goal; her first of the season. The Red Stars got back the two-goal lead in added-time of the first half when forward and captain Christian Press converted a penalty kick. Houston scored their second goal in the 85th minute, from forward Rachel Daly, with an assist from midfielder Kristie Mewis. In the 89th minute, Chicago midfielder Yuki Nagasato received a red card for a hard take down of Daly. She entered the game three minutes earlier as a substitute for Alyssa Mautz. Nagasato She will not be eligible for the Red Stars next weekend, but wiill be available for the playoffs. After the game, Dash interim coach Omar Morales was quoted, "There were times in the game we played really well. There were times in the game we didn't play very well. There is an old Western movie 'The Good, the Bad and the Ugly.' There was a lot of that." Houston was still without the services of Kealia Ohai and Carli Lloyd. Ohai is out with a torn ACL in her left knee and Lloyd is suffering from a left ankle strain. Houston will finish the regular season in Kansas City with a 5 p.m. EDT game against FC Kansas City on Saturday, September 23. HOUSTON, TEXAS (September 23, 2017) The Southland Conference showcases Saturday evening with four football games on tap: headlined by the HBU Huskies facing the McNeese State Cowboys in Lake Charles, Louisiana. The Huskies (1-2) are coming off a 24-3 loss to Abilene Christian last Saturday night (September 16) while the Cowboys (2-1) downed Alcorn State 34-27 on the same day. Freshmen lead the Huskies in nearly every offensive category, with quarterback Bailey Zappe (shown right) completing 44-of-86 passes for 481 yards, a touchdown and two interceptions. Running back James Brown has carried 25 times for 163 yards and a touchdown, while receiver Dennis Houston has made 12 catches for 124 yards. Senior receiver Ethan Fry leads in receiving yards with 150 on eight catches, including a touchdown, while senior running back Terrance Peters has added 138 rushing yards and a score. Senior All-America linebacker Garrett Dolan jumped back into the top 10 nationally in tackles by breaking his own school record with 19 tackles last week at Abilene Christian. He is tied for ninth with 11.3 tackles per game and is the career active leader in the FCS with 429 stops. Senior linebacker Cody Moncure is second on the team with 26 tackles and junior defensive end Johnavhon Graham leads the Huskies with 2.0 sacks. Sophomore safety Nicholas Smith has made two interceptions this season and junior cornerback Raphael Lewis has five pass breakups. McNeese quarterback James Tabary was named this week’s SLC Offensive Player of the Week after he threw for 344 yards and four touchdowns, including the game-winner with 26 seconds left on a 33-yard strike, in a 34-27 win at Alcorn State. He also garnered STATS national player of the week honorable mention honors for his play. The SLC award is the first for Tabary in his career and the first for a McNeese quarterback since Daniel Sams received the honor in November of 2015. It’s the second time in his McNeese career (14 games) that Tabary has thrown for four touchdowns in a game. He tied a school record last year against No. 1 Sam Houston State with 5 TD passes. In other SLC action, SFA (1-2) faces Abilene Christian on the road while Nicholls (2-1) travels to Huntsville to play Sam Houston (2-0). In Hammond, Louisiana, Lamar (1-2) meets Southeastern Louisiana. Tom Savage (3) was 7-of-13 for 62 yards against the Jaguars. HOUSTON, TEXAS (September 10, 2017) The Houston Texans could not not get the offense and defense operating on the same page as they fell to the Jacksonville Jaguars by the score of 29-7 at NRG Stadium in Houston. Rookie Deshaun Watson (4) saw action in the game. J.J. Watt talked about his performance in his first game since September 22, 2016. Houston will travel to Cincinnati to face the Bengals on Thursday Night Football in Week 2. CARY, NORTH CAROLINA (September 9, 2017) The Houston Dash despite recent moves designed to better the team have gone for naught. Saturday night on the road in North Carolina, the Dash lost yet another match. The 1-0 fixture was the team’s third consecutive loss for a side that has already endured a six game losing streak this season. The opposition clean sheet was the tenth against the Houston side in 21 games. Kristen Hamilton’s goal in the 26th minute provided the margin of victory for the Courage as they notched win number 15, one shy of tying the league record set by Seattle in 2014. The shutout by the Courage was their 11th of the season tying the NWSL league record set by the 2013 FC Kansas City. With two games left, NC keeper Katelyn Rowland has eight clean sheets in 2017 is just two off the mark set by Nicole Barnhart in 2013. While the reigning NWSL champions clinched a home playoff game, the loss effectively began the wait till next year dream for the Dash (7-12-2). Houston has three games remaining including a postponed home match due to Hurricane Harvey with the Courage and another home match with the Chicago Red Stars on September 23rd before closing out the season at Kansas City on September 29th. 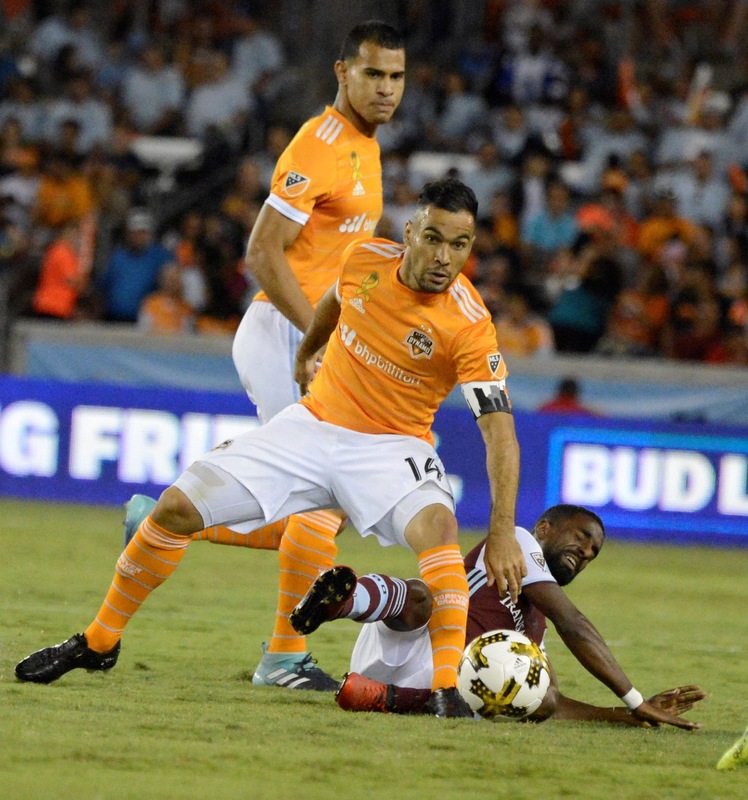 HOUSTON, TEXAS (September 9, 2017) After 90-plus minutes of heated and spirited play, the Colorado Rapids scored a single goal in second half stoppage-time to down the Houston Dynamo by the score of 1-0 on Saturday evening, September 9, 2017 at Houston's BBVA Compass Stadium. In a game that paid tribute to Houston, rescue personnel, and television and radio broadcasters who gave of themselves during the flooding and aftermath of Hurricane Harvey; the players and fans honored what has become known at "Houston Strong." Prior to the game, the Dynamo were 10-8-8, with 38 points, while Colorado were 6-16-4, with 22 points. Houston head coach Wilmer Cabrera talked about losing to a lower ranked team. “It just happens. We can talk about excuses, but you know what? We haven’t played in like two to three weeks. The guys were traveling. The hurricane, we had to travel and practice away maybe that affected that. We cannot make excuses. We thought we played well, but we didn’t played well. They fought and they found a goal and that’s it. Where they good with possession? No. We had the ball, we weren’t good with our possession because possession without purpose is not good. We had the possession without the possibilities, not great possibilities and that’s the reality. We have to understand that and we have to move on for the next game." Colorado's goal came in stoppage-time from forward Dominique Badji, with an assist from forward Stefan Aigner on a counterattack, as the Dynamo threw numbers forward in search of a game-winning goal of their own. The loss snaps a 12-game home unbeaten streak for Houston, the longest-such streak for the club since a league-record 30-game home unbeaten run from 2011-13. Goalkeeper Tyler Deric was quoted (after the game) about the game being a lesson with the past events in Houston. Houston will return to the pitch on Saturday, September 16 when they hit the road to face the San Jose Earthquakes. Jo'Vel McDaniel rushed for 101 yards on 14 carries and two touchdowns for Texas City. TEXAS CITY, TEXAS (September 8, 2017) Clear Lake quarterback Shae Suiaunoa threw for two touchdown and tallied 285 yards of total offense as the Falcon downed Texas City by the score of 28-21 at Stingaree Stadium in Texas City on Friday, September 8, 2017. The Falcons scored two touchdowns in the first quarter before Texas City was able to get on the scoreboard late in the second quarter. The Stingarees scored a touchdown in both the third and fourth quarter, but it was not enough to stop the Falcons. Clear Lake also put TDs on the board the in the third and fourth quarter to close out the scoring. The Falcons scored their second and fourth touchdown on carries by Brendon Holmes. The sophomore wide receiver carried the ball 14 times for 80 yards and the two TDs. Jo'Vel McDaniel rushed for 101 yards on 14 carries and two touchdowns for Texas City. Next up for Texas City is a September 15 match up against Dickinson on the road. Clear Lake will also hit the road for a September 14 game against Fort Bend Clemens. HOUSTON, TEXAS (September 8, 2017) After having to reschedule the Labor Day Classic, the TSU Tigers had their football home opener at BBVA Compass Stadium on Thursday, September 7, 2017 and after a hard-fought contest, ultimately fell to the HBU Huskies, 24-17. TSU and Aaron Cuevas got the scoring 261started with a field goal late in the first quarter but HBU immediately answered with a 60-yard touchdown scored by Ethen Fry. TSU’s defense was put to a major test but fought back, forcing HBU to punt seven times but the Huskies were tough and caused the Tigers to punt nine times in return. HBU quarterback Bailey Zappe scored a touchdown along with Ethen Fry and James Brown, who scored late in the fourth quarter to secure the win. Tiger quarterback Jay Christophe appeared to have trouble with clock management early in the first half, letting the play clock run to zero. The coaches were forced to call time outs twice within 40 seconds of each other to avoid delay of game penalties. He got into the flow eventually and ended up running for a touchdown himself as well as a late push in the final minute where he sent a nine-yard pass to Darvin Kidsy; who ran it into the end zone. With the unsuccessful attempt at an onside kick, the Huskies took a knee and let the clock run down the final seconds. They played well, but in the end, it wasn’t enough. The Tigers have a bye week this coming week and then they’re off to play Alabama A&M on the road. the second-most in HBU history. HOUSTON, TEXAS (September 7, 2017) The Houston Baptist University Huskies pushed their 2017 season record to 1-1 with a 24-17 win over the Texas Southern Tigers at BBVA Compass Stadium in Houston on Friday, September 7, 2017. In the two times the Huskies and Tigers faced each other, HBU has come out on top, including a 24-20 win in 2016. The Tigers got on the scoreboard first with a 27-yard field goal by Aaron Cuevas to cap an eight play, 81-yard drive to take an early 3-0 lead after 8:15 of play. HBU responded 22 seconds later, on the first play from scrimmage after the kickoff and return, when quarterback Bailey Zappe found Ethan Fry open down the field and connected with the senior wide received for a 60-yard pass for six points. Alec Chadwick added the kicking conversion to give the Huskies a 7-3 lead. TSU regained the lead with 2:08 left in the first half when Jay Christohe carried the ball the final one yard for the score. The quarterback keeper play completed a two play, 62-yard drive to go to the locker room with a 10-7 lead at halftime. After some serious give-and-take play in the third quarter, HBU took back the lead at the 6:13 mark of the third quarter; with a one-yard run by Zappe for the Husky's second TD of the game. Chadwick converted for the extra point to move the score to 14-10 in favor of HBU. They added a field goal with 7:18 to go in the game when Chadwick booted a 36 yarder to give the Huskies a seven point lead (17-10). The Huskies added an insurance touchdown and extra point on a 33-yard rush by James Brown and another Chadwick kick with 2:12 left in the game. The Tigers put together a seven-play, 75-yard scoring drive to close out the game scoring with 23 seconds left in the game. Zappe completed 16-of-32 passes for 248 yards, the second-most in school history, a touchdown and an interception for the Huskies. Brown carried 14 times for 118 yards while Fry caught three passes for 88 yards and a touchdown. Senior linebackers Garrett Dolan and Cody Moncure each had eight tackles for HBU. Junior cornerback Raphael Lewis made five tackles and broke up four passes, while senior safety Taylor Thompson had four tackles and a key interception. Senior punter Christian Guzman averaged 44.0 yards on seven punts, with six of them landing inside the 20. 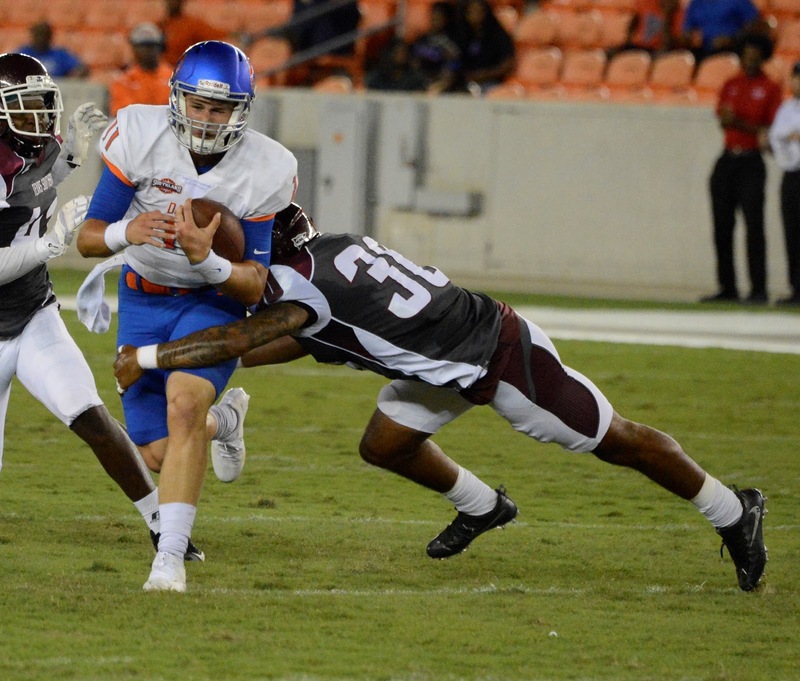 Texas Southern and HBU faced off in 2016 at Husky Stadium. HOUSTON, TEXAS (September 5, 2017) On Thursday, September 7, 2017, the Texas Southern Tigers will kickoff their 2017 hurricane delayed home season when the host crosstown opponent Houston Baptist University at BBVA Compass Stadium. The Tigers will be taking to the gridiron for the first time in 2017, having their season opener against Prairie View A&M postponed due to Hurricane Harvey. 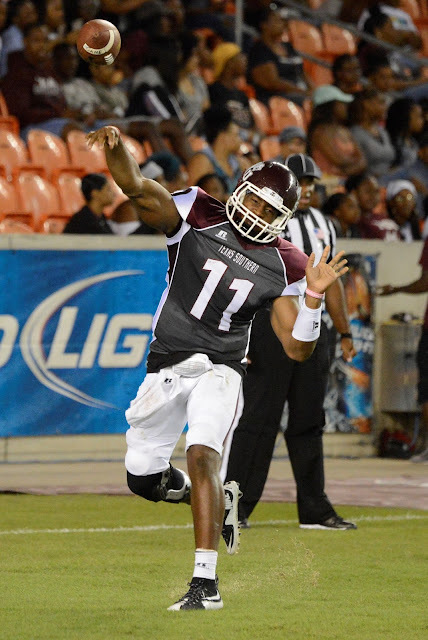 Texas Southern is coming off a 4-7 season in 2016 with a 2-7 Southwestern Athletic Conference record while the Huskies posted a 4-7 record in 2016 and a 3-5 Southland Conference record. Last season, the Tigers and Huskies faced off for the first time in both program's history. HBU came away with a 24-20 win at Husky Stadium. Both teams are 0-1 in 2017, with the Tigers falling to Florida A&M by the score of 29-7 on August 26. Playing at Bobcat Stadium in San Marcos, Texas, the Huskies dropped a 20-11 decision to Texas State on September 2, 2017. HBU will be led by senior linebacker Garrett Dolan. The 6-2, 240 pound Barbers Hill (TX) High School product had 135 tackles in 2016 and is a three-time all-conference selection. The Tigers are led by quarterback Jay Christophe, who missed last season with an injury. Texas Southern head coach Michael Haywood is entering second season at the helm of Tigers, posting a 4-7 record in 2016. Previously, Haywood was the head coach at Miami (Ohio) posting a 9-14 record for two years. HBU head coach Vic Shealy is entering his fifth season guiding the Huskies. He has posted an 11-29 record with at HBU. HOUSTON, TEXAS (September 4, 2017) HBU looks to remain undefeated when it faces Prairie View A&M in a non-conference volleyball match Tuesday at 7 p.m. at Sharp Gym. The Huskies will not play again at home for three-and-half weeks before the their Southland Conference home opener against Lamar on Sept. 28. The video broadcast with Russ Reneau and former HBU setter Kayla Armer will be available on HBUHuskies.com. Senior outside hitters Bailey Banks and Jessica Wooten lead the way for HBU (4-0), with Banks averaging 3.20 kills and 2.80 digs per set and Wooten averaging 2.93 kills and a team-leading 3.80 digs per set. The Huskies’ other three starting attackers – redshirt freshman right side Ashtyn Richey, senior middle blocker Blair Gillard and junior middle blocker Kayla Davenport – are each averaging more than two kills per set, with Gillard also posting 1.00 block per set. Freshman setter Abby Gargus paces the offense with 10.38 assists per set, while also chipping in with 2.31 digs per set. Senior libero Hailey Erickson anchors the back row with 3.79 digs per set. PVAMU has yet to play a match this season after not traveling to North Texas for its season-opening tournament scheduled for Aug. 25 and 26 due to Hurricane Harvey, then postponing its home match against HBU last Tuesday. The Huskies head to San Marcos for the Crests & Creeds Classic, where they will take on UMass Lowell in the opener at 11 a.m., followed by UTSA at 5 p.m. Friday. HBU then faces host Texas State in the finale Saturday at 5 p.m.
HOUSTON, TEXAS (September 4, 2017) On Monday, February 4, 2017, the Houston Cougars named their team captains for the 2017 football season. The selection was based off a player vote. Junior defensive back Garrett Davis and senior receiver Steven Dunbar, along with senior linebacker Matthew Adams and senior running back Dillon Birden were chosen to lead the Cougars both on and off the field. Dunbar, who hails from Metairie, Louisiana, tallied five touchdowns and 53 receptions for 692 yards last season. Adams led the Cougars with 82 tackles (57 solo) along with two forced fumbles. Davis, appeared in 26 games in his first two season for the Cougars; including starting in 12 of 13 games in 2016. Birden, who joined the program in 2016, led Houston with six rushing TDs and recovered two fumbles. After having their first game of the season postponed due to Hurricane Harvey, the Cougars will kick off the 2017 season with a Saturday, September 9 road game against Arizona. The Cougars and the Wildcats have played twice before. In their first game, on October 11, 1969, Houston came out on top by the score of 34-17. Their next match-up came 17 years later, on September 6, 1986, with Houston dropping a 37-3 decision. Both games were played in Arizona. Houston will play their first home game on Saturday, September 16 against cross-town rival Rice. They have played each other 40 times with the Cougars hold a 29-11 advantage. The last two times Houston and Rice played; in 2012 and 2013, the Cougars have come out on top. On September 29, 2012, they posted a 35-14 win and on September 21, 2013, the downed the Owls 31-26. Both games were played at Reliant Stadium (now NRG Stadium). HBU true freshman Bailey Zappe was 21-of-34 for 199 yards against Texas State. SAN MARCOS, TEXAS (September 2, 2017) The HBU Huskies jumped out to a quick 9-0 lead in the first quarter, but the Texas State responded with 20 unnswered points as the Huskies dropped a 20-11 decision to the Bobcats at Bobcat Stadium in San Marcos, Texas on Saturday, September 2, 2017. The 15,560 fans in attendance saw HBU dominate offensively much of the first half, but a stubborn Texas State defense shut down the Huskies during the second half. The Huskies wasted no time getting on the scoreboard at the start of the game. After stopping the Texas State initial drive, HBU took possession of the ball and drove 71 yards in seven plays for their first score of the 2017 season. Running back Terrance Peters carried the final one yard to give the Huskies six points. The 5-9, 190-pound senior rushed for 574 yards and four touchdowns his junior year. They added three more points to their total when Alec Chadwick booted a 33-yard field goal with 58 seconds remaining in the first quarter. The field goal capped an 11-play, 70-yard drive that lasted 3:26. The Bobcats finally scored at the 4:25 mark in the second quarter with a James Sherman 25-yard field goal. With 43 second remaining in the first half, Damian Williams scored on a four-yard quarterback keeper for six points. Sherman booted his first extra point of the season to give Texas State a 10-9 lead at halftime. You can view a slideshow of the game by Darla S Tamulitis, La Vita Loca Photography by clicking here. In the second half, Texas State found the end zone with 2:06 left in the third quarter. Anthony Smith carried the ball 48 yards for six points. Sherman added his obligatory extra point to give Texas State a 17-9 lead. They added another field goal by Sherman, this time a 26-yarder with 13:05 remaining in the game. HBU added two points at the 9:03 mark in the fourth quarter when Andre Walker recovered the ball in the end zone off a bad Bobcat snap for the safety. for 51 yards and one touchdown . HBU true freshman quarterback Bailey Zappe completed 21-of-34 passes for 199 yards with no touchdowns and no interceptions. Peters rushed 12 times for 53 yards and the Huskies’ lone touchdown, but did not play in the second half after leaving the game with an injury. Huskies head coach Vic Shealy was quoted after the game. Senior linebacker Cody Moncure led the Huskies with 11 tackles, sophomore defensive end Andre Walker made nine, including a safety, and senior linebacker Garrett Dolan added seven stops. Junior defensive end Johnavhon Graaham recovered a fumble forced by senior safety Taylor Thompson and sophomore safety Nicholas Smith made an interception. The Huskies will have a short week to prepare for their next matchup; a Thursday, September 3 game against cross-town opponent Texas Southern. Kickoff is set for 7:30 p.m. CDT at BBVA Compass Stadium. Last year, HBU downed TSU 24-20 at Husky Stadium. NEW BRAUNFELS, TEXAS (September 1, 2017) New Braunfels High School took a two-point lead into the locker room at halftime and decided their 21-19 lead over Alamo Heights was not enough. With a second half surge, the Unicorns did not allow the Mules to score, while putting 24 points on the scoreboard to take a 45-19 win in week one one of football action for both schools New Braunfels, Texas on Friday, September 1, 2017. The locals packed the press box side of Unicorn Stadium to support the boys in blue and white; cheering every score and long yardage play to help the Unicorns nail down their first win of the season. New Braunfels would have had an even bigger margin of victory if it had not been for Alamo Heights wide receiver Nik Proctor. The junior scored all three of the Mules' touchdowns, on three consecutive possessions, with kicker Seth Ellis making only one of his three extra point attempts. Unicorn quarterback Ryan Redding rushed for 226 yards and two touchdowns while teammates Tanner Steele and Ethan Duliban each caught one touchdown pass. Zachary Yaws and Devon Chambers each scored on rushing TD. Proctor caught eight passes for 151 yards and three touchdowns for Alamo Heights. Next up for the Unicorns is a September 8 match up against Seguin High School. Alamo Heights will face San Antonio Brandeis on the same day.